Coming out toward the end of September is The Cambridge Introduction to Sylvia Plath by Jo Gill, of the University of Exeter. Cambridge University Press has some of the contents online through their website. 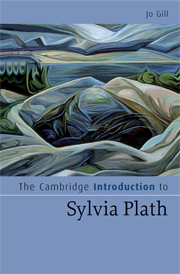 The Cambridge Introduction to Sylvia Plath is a short introductory guide to Plath's work (poetry, prose, journals, etc. and to the critical reception of her writing) aimed primarily at students and interested general readers. Those familiar with Gill's essays on Plath (Sexton, and others) should be on the lookout! Available through Random House is an ebook version of The Unabridged Journals of Sylvia Plath, 1950-1962 edited by Karen Kukil. At only $9.95, who wouldn't want a PDF of this wonderful book, which is likely fully searchable? The Unabridged Journals of Sylvia Plath, 1950-1962, as an ebook, is available through either Amazon.com or Sony eBook. It does require downloading some free software. The Amazon Kindle version, from what I can, is available on the Kindle only, whereas the Sony eBook is available on either a Sony eBook reader or on a PC. Advantage: Sony. If anyone knows something more about the Kindle, please post a comment! Soap box: For anyone who read the comments to my posting of 16 July 2008, in dissing the poetry of Sylvia Plath, Mr. Bradford says, "I believe that after the death fo robert Frost, poetry went rapidly downhill." His remarks (both in the comments of my blog and on his own blog) are hardly worth considering; however, there could be merit to his belief, particularly as so many very well-known poets passed away in that decade. In a way poetry literally died. Of the poets that died in the 1960s, Plath was by far the least well-known at the time of her death. This of course has flipped, as for all the poets on the list, few are now as well-known (though all, clearly are still read, loved, taught, considered, etc.). Poetry evolves, though, and that what keeps the it always contemporary. Primary source for the above list is the Notable Names Database. Poet's Graves is a valuable website for learning where poets are buried. Many of the poets on this list are featured. In June, Bloomsbury New York held an auction and one of the items for sale was "Aunt Rennie and the Elves" by Sylvia Plath. The 3 page, 49-lined story, typed and signed "By Sylvia" was composed in 1943. Bidding closed at $4,000 on 19 June. The winner is unknown at this time. Sally Bayley recently had published "‘I Need a Master’: Sylvia Plath Reads D. H. Lawrence" in the journal English 2008, 57: 127-144. Copies are available at many university libraries, through Interlibrary loan, and at select bookstores. Frances Wilson reviewed Eye Rhymes: Sylvia Plath's Art of the Visual by edited by Kathleen Connors and Sally Bayley in the December 2007/January 2008 issue of Literary Review. Look for it on pages 34-5. In the same issue, on pages 43-44, there appears a review of The Letters of Ted Hughes by Alan Brownjohn. Chapman, W. K. "Last Respects: The Posthumous Editing of Virginia Woolf and Sylvia Plath." The South Carolina Review. 2006: 65-71. Hwang, J.H. 2007. "Women's Space and Silenced Voices during the Cold War in Sylvia Plath's Poetry." Feminist Studies in English Literature. 15 (2): 65-86. Jackson, Anna. Sylvia Plath's "'Exaggerated American grin': Anti-American Sentiment and the reception of Plath's poetry." Journal of Transatlantic Studies. Autumn 2007: 117-132. Though it is several years old, I stumbled upon Anne Stevenson's review of The Journals of Sylvia Plath 1950 – 1962. London: Faber. The review appeared in Thumbscrew 16, Summer 2000. A general search of the poetrymagazine.org.uk website finds 59 hits when "Sylvia Plath" is typed in a keyword search. A review by David Orr of Frances Richey's The Warrior appears in The New York Times. It mentions Plath, Robert Lowell, and other writers. Orr's comments on the "emotional truth" of personal poetry and how Plath fits into this style are very astute. I recently had occasion to be in Chatham and West Harwich on Cape Cod. While there, I took two new photographs in West Harwich of the site of The Belmont Hotel, where Plath briefly waitressed in the Side Hall in the summer of 1952. The hotel is gone, but the name The Belmont lives on as a condominium development. 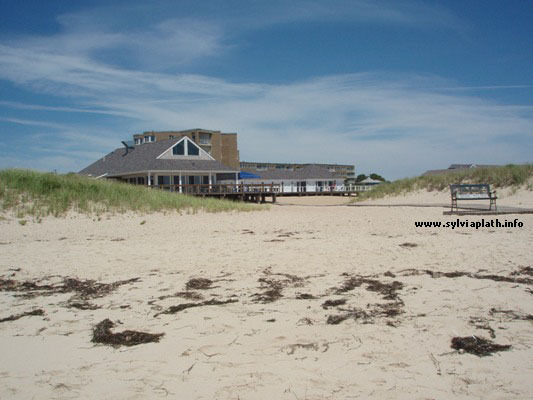 This picture shows the view from the beach towards where the hotel was. 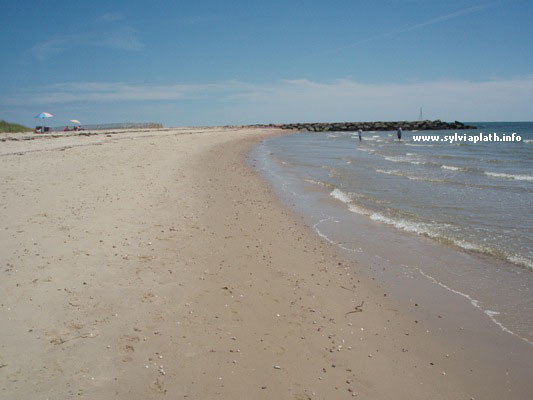 This picture shows the beach, which is a private beach. The locals seemed to steer clear of the Belmont beach, and since I don't look good in orange, I opted not to trespass. Both photographs are in the thumbs50-55 page. I recently obtained the details of the Sylvia Plath related files held in the Yaddo Records (New York Public Library). I wrote about this first in April, click here to see that posting. To recap, Plath and Hughes stayed at Yaddo from September - December 1959. 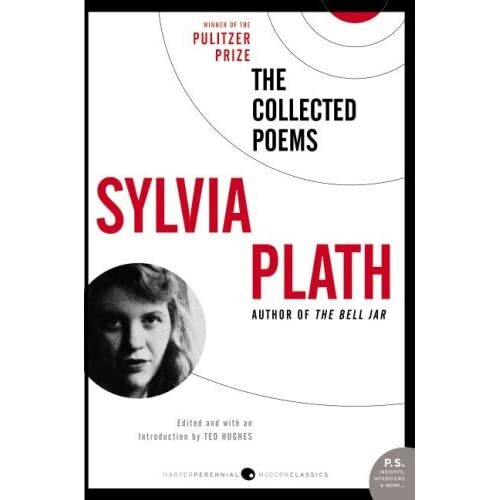 It is here that Plath wrote many of the poems that completed her first volume of poetry, The Colossus. Yaddo is located in lovely Saratoga Springs, New York - 199 miles from Boston, 194 miles from New York City, New York, and 4,258 miles from North Pole, Alaska. The New York Public Library obtained these records in 1999. The main correspondents in the file are Sylvia Plath (and Ted Hughes) and Elizabeth Ames, the Executive Director of Yaddo, though there are others. All material dates from 1959. Below is a list of letters. 1. Elizabeth Ames to Sylvia Plath and Ted Hughes, typed, undated, 1 p.
2. Sylvia Plath to Elizabeth Ames, typed, 11 February 1959, 1 p.
3. Elizabeth Ames to Sylvia Plath, typed, 13 February 1959, 1 p.
4. Sylvia Plath to Elizabeth Ames, typed, 22 February 1959, 1 p.
5. Elizabeth Ames to Philip Booth, typed, 25 Feburary 1959, 1 p.
6. Elizabeth Ames to John Sweeney, typed, 25 Feburary 1959, 1p. 7. Philip Booth to Elizabeth Ames, typed, 28 Feburary 1959, 2 p.
8. John Sweeney to Elizabeth Ames, handwritten, 6 March 1959, 2 p.
9. Elizabeth Ames to Sylvia Plath and Ted Hughes, typed, 3 April 1959, 1 p.
10. Sylvia Plath and Ted Hughes to Elizabeth Ames, typed, 8 April 1959, 1 p.
11. Elizabeth Ames to Sylvia Plath and Ted Hughes, typed, 12 August 1959, 1 p.
12. Sylvia Plath to Elizabeth Ames, typed, 24 August 1959, 1 p.
13. Sylvia Plath to Elizabeth Ames, typed, 5 September 1959, 1 p.
14. Elizabeth Ames to Sylvia Plath and Ted Hughes, typed, typed, 16 September 1959, 1 p.
They also have typed "file" notes by anonymously acronymed people - R. E., J. C. , and M. D. Z. R. E. I think is Richard Eberhardt. J. C. may be John Cheever. M. D. Z. I think is Morton Dauwen Zabel. At any rate, M. D. Z. 's comments on Plath are particularly interesting. The New York Public Library is online here. The section of the library you'll want to contact is the Manuscript & Archives division. The finding aid to the Yaddo Records is online here. The Plath materials are in Box 276 (page 79 of the finding aid). To contact the archives, email mssref at nypl dot org. There haven't been many news stories recently about Sylvia Plath, though her name has appeared in various articles. On 4 July, David Baddiel at The Times reviews the new movie about Dylan Thomas called The Edge of Love. He dedicates a paragraph to questioning the purpose of the movie Sylvia (2003). So, I will just say that I have added a new web page to my website, A celebration, this is. The new page had to do with Plath's Audio recordings. Kate Moses has two recent essays in The Unraveling Archive: Essays on Sylvia Plath (ed. Anita Helle, 2007) that are must reads for anyone interested in Plath's voice and Plath's recordings. And, for those who have never heard Plath's voice, the webpage lists the commercial releases. Plath Profiles is still working its way towards you! I think about 90-95% of the essays are ready to go. We're waiting for last edits on two papers. And, two will be delayed as the authoresses await word about permissions. Those two papers will appear online at a later date, but are very much a part of Volume 1. For anyone not able to attend the Sylvia Plath 75th Year Symposium at Oxford in October 2007 (and Smith in April 2008), you'll get to read many of the papers presented. There are 26 total essays - many of which include illustrations, there are 6 poems inspired by Plath, and there are two wonderful book reviews. It is my hope that within a week or two the issue will be online. Have a good week! Happy Plathing. The publication date for the new edition of Sylvia Plath's The Collected Poems & the new Johnny Panic and the Bible of Dreams has been pushed back from 12 August to 2 September. However, the new cover for The Collected Poems is out. Please see the image to the left. Well, some disappointing news regarding what promised to be a welcome addition to Sylvia Plath scholarship. Linda Wagner-Martin's Sylvia Plath's Poetry (Continuum) appears to be shelved due to permissions issues in England. I have made some updates to sylviaplath.info; most of it cosmetic. I've extended the tables a bit. Also, I've re-designed the home page slightly, offering links to the individual photograph albums and book cover galleries! I hope these modifications make viewing easier! I do plan to add "next album" or "next gallery" links at some point, which might also improve your browsing experience. 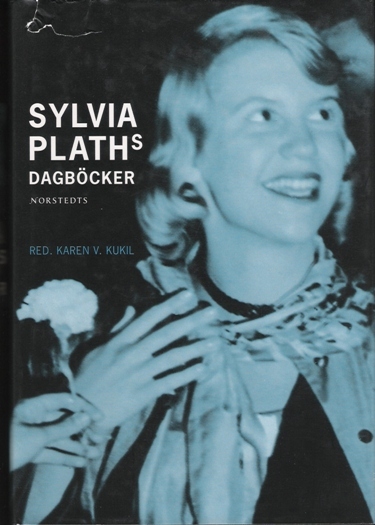 I've added a book cover to the Non-English page; the Swedish edition of The Journals of Sylvia Plath, which was a recent gift. 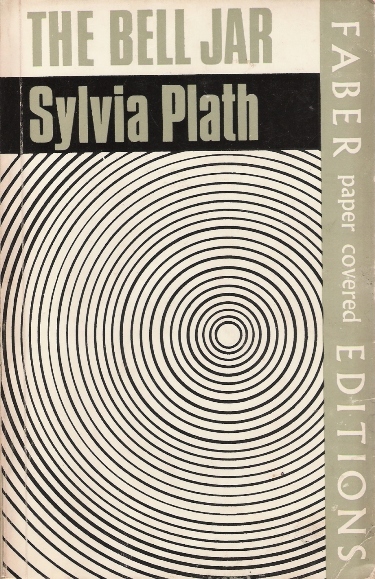 Also, there is a new copy of The Bell Jar - from the Faber paper covered editions in the 1970s. I'm working on a new page with new content and new images! Hopefully it'll be up within a week. A note about Plath Profiles since I know there is a lot of interest. We're waiting for final edits on about three or four papers and waiting on permissions for the use of some images.